This is an area to post interesting/intriguing/unknown things about testate amoebae or about the society. Please provide some general information about the organisms you post here (e.g. size, habitat). This is a good place to ask questions to the community. Many researchers are finding it difficult to put the correct name on the testate amoebae they see. This is understandable as 1) good taxonomic monographs are rare (but check the literature section and identification guides for precious resources!) and 2) the taxonomy of many groups is unclear. 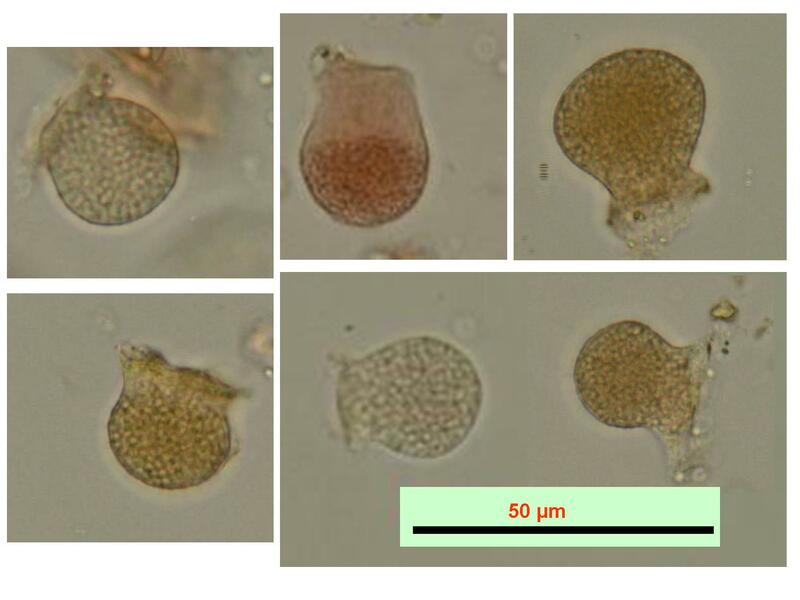 A suggestion for good practice is to 1) post images of mystery amoebae and 2) when you get a useful name please don't forget to acknowledge the help you received (name the colleague who helped and mention this website) in any publication. This way this forum becomes more useful and dynamic! 22/11/2011- Mystery microfossil, identification requested by Richard Payne. 3/14/2011 - Nebela from British Columbia (Canada), identification requested by Edward Mitchell, mystery solved by describing a new species! Anna Šímová needs more details on the Cryptodifflugia she has found. The forum discussion can be made here. 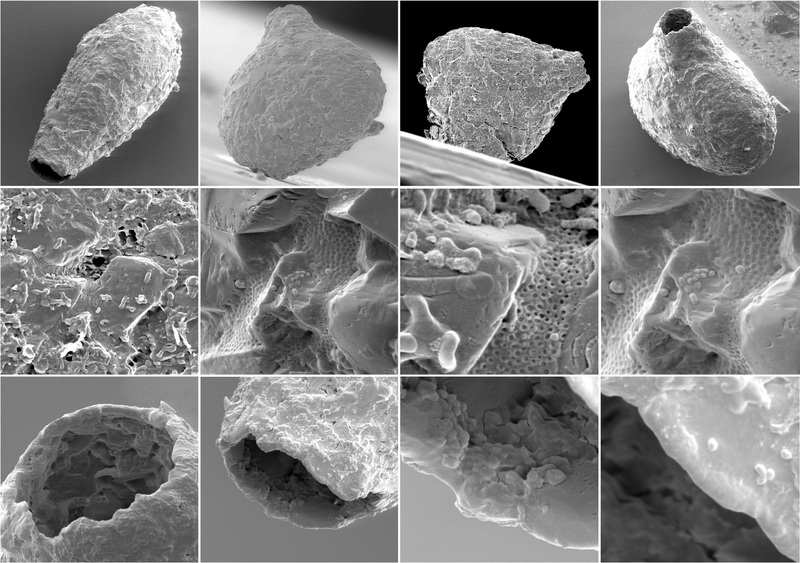 Tom Roland and Matt Amesbury have found the following microfossil in cores and surface samples from Polytrichum moss banks at various sites on the Antarctic Peninsula. They request your opinions! Tom brought an example of the sample to ISTA7 in Poznan but no one could reach a confident conclusion in the time available. Any further suggestions can be made as a forum post here. Manish Kumar, in India, has found the following and requests opinions. Length of shell is 64.6. Any suggestions can be made as a forum post here. Does anybody have an idea where I should look to identify this cell. The plate scales remind me of Trinema. 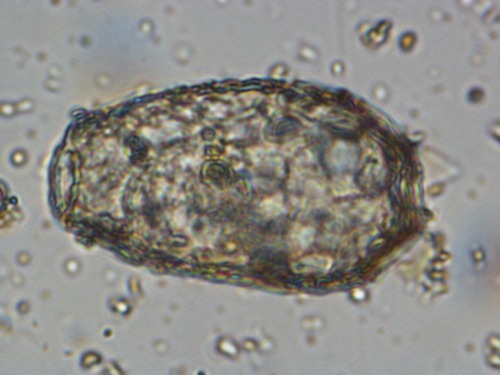 This testate amoeba was found in multiple samples from peat bogs in Tierra del Fuego. It is about 60x40mm in size with one aperture. It has particles stuck to the aboral region pretty much like Heleopera, although there is no slit-like aperture, rather an irregular circle. Would anyone know this taxon? Thank you. 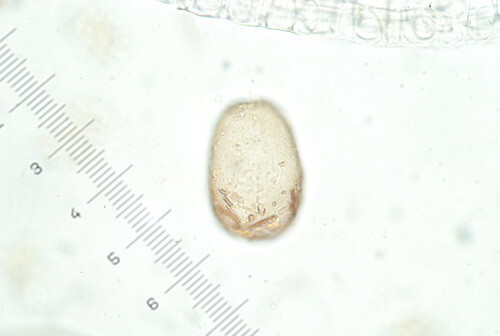 I found a testate amoebae like species from a peatland, For me, it looks like a Assulina sp. The size is small, but with a lot of individuals. Please give your comments for this species taxomomy. I have tried to upload the picture to our website ISTA for many times, but it does not work. Can some one help me to upload so that we can make the website accessible for the society. 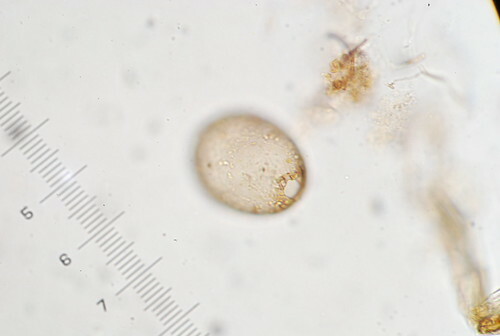 Analysing surface samples from Tierra del Fuego, I encountered this testate amoeba (? ), restricted to "wetter" peat. I initially thought it would be Pseudodifflugia fascicularis, but after a closer look I started doubting. As you may see in the photos, the aperture is a bit a-typical, with a recurved collar, visible in the second picture. The outline is also somewhat different from what I have identified before as P. fascicularis. Size is about 30 micron. Hi folks, I was wondering if anyone could help identify these beasts. They are from a peatland mesocosm experiment and are very numerous. They are about 30-50 microns diameter and appear to be made of primarily organic xenosomes. In some (eg. pic 6) there appears to be an irregular-shaped aperture occupying much of a side. My first instinct was maybe Phryganella acropodia but these look odd to me. Firstly in some of them it is really hard to see any aperture at all (but these are in a plankton chamber so it's not easy to turn them over without sending everything flying). Secondly, some of them seem to have a weird sort of 'halo' rather than a clear edge to the test which looks a bit weird. What do you think? any ideas? I've already asked a few people and the general opinion has been 'maybe P. acropodia'. 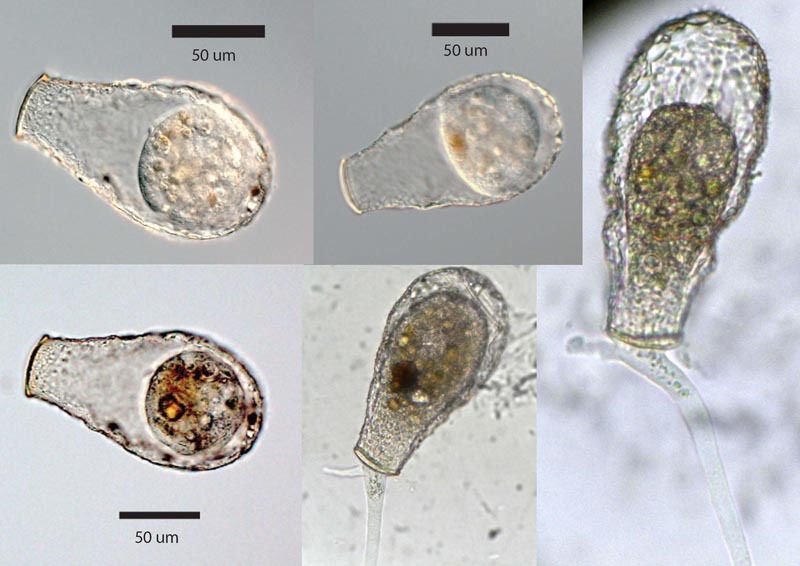 SOLUTION This amoeba was described as a new species: Nebela meisterfeldi n. sp. Heger et Mitchell, in honor of Dr. Ralf Meisterfeld, one of the most distinguished researchers in testate amoebae systematic and ecology in recognition for his contribution to this field. Original Request Thierry Heger found this Nebela species in British Columbia (Canada). We believe it is a new species as it does not match any described species we know. If you have any suggestion, we can discuss about it in the Forum! SOLUTION Yuri Mazei has identified this amoeba as Difflugia nodosa. Taxon was originally described by Leidy as Difflugia pyriformis var. nodosa, and raised to species status by Ogden and Zivcovic 1983. You can check out page 355 of the Ogden and Zivcovic reference for SEMs of this beast which is freely available at BHL here! Original request - I found about 8 of these amoebae some years ago in the beautiful Serra do Japi, located in my hometown Jundiaí. The Serra is one of the last remaining Atlantic Rainforest reserves. There is quite a deal of controversy whether it is primary or not. In any case, I found this thing and did not know what to make of it. I originally thought it looked like a Pontigulasia, but the v-shape in the neck was not very clear. Then I thought it looked somewhat like the Difflugia pyriformis or Difflugia compressa portrayed by Leidy. Then when I went to the SEM and saw the cement (which seems Lesquereusia-like), I didn't know what to make of it. If you'd like to help me out with identifying this beast, we can discuss about it in the Forum!